Build your Own Flypack with the Best A/V Console on the Market! 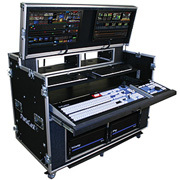 PortaCast flypack consoles can be purchased without any components except for the monitor(s) which are part of the unique flip-lid assembly. So if you already have components and just need an empty flypack… then a PortaCast System Builder Kit (SBK) is a great solution! 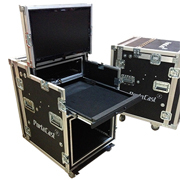 Your choice of models: the PortaCast Deluxe with two 27" hi-res monitors and 24 Rack Spaces, the PortaCast Classic with a single 27" hi-res monitor and 12 Rack Spaces, and the compact/narrower PortaCast Classic Jr. with a single 24" hi-res monitor and 12 Rack Spaces. PortaCast Deluxe SBK with Two 27″ Monitors!